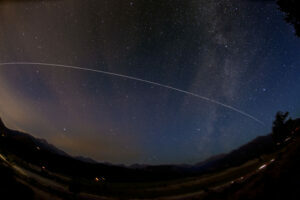 The International Space Station flying over Moraine Park very early Monday morning. The Milky Way and Summer Triangle are on the right side. (click to enlarge all these photos). Here’s a couple of night pictures I’ve been working on. Finally managed to get a decent shot of the International Space Station during a fly over. There is a website, heavens-above.com that lists all sorts of astronomical stuff in the sky. If you put in your location it will make a chart showing the times and dates that the ISS flies over your location. I made 2 charts for the 2 weeks I’m here just before I left. It tells you the compass directions, how many degrees above the horizon it will be and the exact times it will appear and disappear. After a few not so great shots I got up at 4:00 am this morning to see it from the cabin. Turns out the flyover would be seen perfectly from the front of the cabin as I look out at Moraine Park and the range behind it, including Longs Peak, the highest in Rocky Mountain. I got up early to set up the star tracking device I’ve been using tosh oot a few pictures of the Milky Way and other things. The sky begins to lighten in the pre-dawn hours about 4:35 am to the exposure was going to be tricky. I had shot some pictures the night (morning?) before around that time, so I had a guide to go by. I had the super wide fish-eye lens on since it looked like it would be going from horizon to horizon from northwest to southeast. I set the camera for 5 minutes and waited. It’s always a guess since the web site times are always accurate, but your watch may not be. So just after 4:40 am, I pressed the button and saw the light of the space station moving up from the northwest. It looks like a bright star, this morning it was very bright. So you really don’t see much except this moving point of light. But it’s impressive to think that this is the ISS where people are living and working, flying right over where you’re standing. Trying to figure out how to shoot it has been difficult. But I think this method worked. The ground is blurry since we (the earth) is moving- with night photos you can get either the stars sharp or the earth, not both- but it’s not too distracting. My nightmare was that a car would pass by on the road below the cabin, flooding the picture with bright light. Hikers who want to get an early start for a mountain climb at a nearby trailhead often start around 4:00 to 5:00am. So about a minute into the exposure, I see a car approaching from the west. I have a small piece of cardboard covered with black cloth that can be used to partially cover the lens if you don’t want parts of the picture to be overexposed. I don’t use it much, but it came in handy as the car passed. Fortunately there was only one car. The Milky Way through ponderosa pines at Bear Lake. 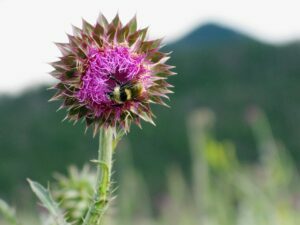 On a walk in the field across the road from the cabin, I saw a busy bee on a plant that doesn’t seem to appear in the “Field Guide to Wildflowers of the Rocky Mountains”. Closest description seems to be a thistle. I’ll have to ask someone.